Since 1944, the National Council on Alcoholism and Drug Dependence (NCADD, Inc.) has been a valuable resource for millions of people struggling with addiction. Our founder, Marty Mann, was a true pioneer. Marty got sober in the rooms of Alcoholics Anonymous (AA). Marty exuded courage and unwavering belief in the dignity of all people. She worked tirelessly to provide education to raise the awareness of addiction across the country. NCADD’s National Network of Affiliates provide community-based prevention and education, as well as local media awareness and understanding of the disease and the potential for treatment and recovery. NCADD-Rochester Area is proud to have been an affiliate of our national organization since 1946. In 2018, NCADD merged with Facing Addiction, Inc. to become Facing Addiction with NCADD. To learn more about NCADD visit their website at www.ncadd.org. 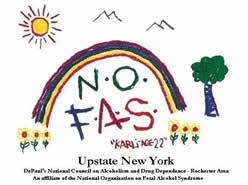 The National Council on Alcoholism and Drug Dependence-Rochester Area (NCADD-RA), has been designated as the national upstate New York affiliate of the National Organization on Fetal Alcohol Syndrome (NOFAS) Network. NCADD-RA is one of 35 state and international NOFAS affiliates. NOFAS is dedicated to eliminating birth defects caused by alcohol consumption during pregnancy and to improving the quality of life for those affected by FASD (Fetal Alcohol Spectrum Disorder). NCADD-RA will continue to work on region-specific projects such as holding FASD (Fetal Alcohol Spectrum Disorder) workshops and conferences for professionals, providing community education and awareness presentations and offering information and resources on FASD. NCADD-RA hosts a monthly FASD Parent Networking and Support Group from 10 a.m.-noon typically on Wednesday mornings at DePaul’s NCADD-RA 1931 Buffalo Road location. Visit the NOFAS site at: www.nofas.org. For more information on NOFAS, please contact NCADD-RA at (585) 719-3480. The National Association for Children of Alcoholics (NACoA) believes that the people hurt most by drugs and alcohol don’t even use them; they are the children of alcoholics and other drug dependent parents. NACoA believes that none of these vulnerable children should grow up in isolation and without support. NCADD-RA is a proud affiliate of NACoA with our mutual focus on eliminating the adverse impact of alcohol and other drugs on children and families. To learn more about NACoA, visit their website at www.nacoa.org.